Recently, the State Administration of Press and Publication issued the 2017 Analysis Report on Press and Publishing Industry, which reports that the overall economic scale of Anhui Xinhua Distribution Group has once again been the largest among domestic counterparts,topping the list for five consecutive years. 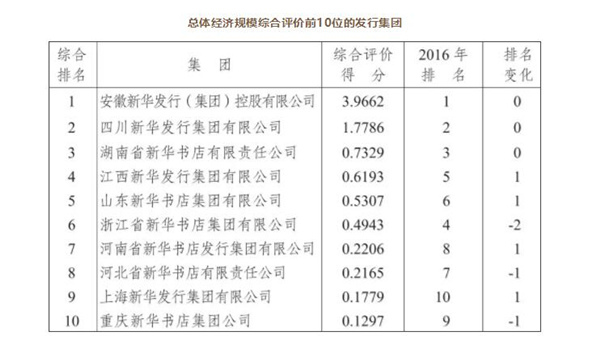 According to the report, the comprehensive evaluation score of the overall economic scale of the group is 3.9662, further rise from last year's 3.8948(Sichuan Xinhua Distribution Group Co., Ltd is placed second on the list with a score of 1.7786). In 2017, the national distribution groups continued to maintain a good momentum of development. The total assets of the Anhui Xinhua Distribution Group, the owner's rights and the main business income were over 10 billion yuan respectively. The report also points out that the results of the development of the publishing integration have emerged, and the new model of knowledge service is constantly springing up, and a number of projects such as the Shared Bookstore of Anhui Xinhua Distribution Group are in good progress.